1 or 2 bdrm ocn view, child friendly, WiFi, meditation, org.farm, pool, permit. Location, location, location... all year round heavenly weather... High Speed WiFi & Cable TV... sunrise and sunset walks on Holokai road... swimming in the salt water pool...yoga and meditation in the hut overlooking the ocean and the jungle below...immersed in nature with sounds of chirping birds, swaying palms and pounding waves...only 5 minute drive from cafes, shopping, waterfalls & beaches...stay connected with high speed wifi...play with two nanny goats and a dozen chickens. A convenient & central location between the jungles of Hana and the tourist attractions of Lahaina & Kihei. Organic farm...No use of insecticides, artificial scents, harsh chemicals. The HIBISCUS HIDEAWAY has stunning ocean views in tropical gardens, ensuite full bath, High Speed WiFi, Cable TV, complimentary laundry facilities, bbq. There is a, 40 ft salt water pool, meditation /yoga hut ,shared by two other units on the two and a half acre estate. The Private Hibiscus Hideaway apartment suite has a king bed...can be rented as a one or two bedroom... as a two bedroom the second bedroom will have two twins or one king bed... when rented as a one bedroom the second bedroom is left unoccupied . of the gulch/ cliff overlooking the ocean and great for sunrise meditations...afterwards plunging into the saltwater pool or taking a stroll on Holokai road. There is a private studio near the Hibiscus Hideaway apartment that has an ENSUITE bath, a king bed and a full size futon couch. There is a two bedroom cottage, the Whispering Bamboo cottage set by itself on the edge of the property. To rent these please contact us. A world famous artist who stayed with us recently wrote this back to us..... 'For six days before Christmas, we woke up in the puffy clouds and softly colored ocean waves in the comfort of this magical space. Painted by the owner on the walls are pastel spirals, waves and seafoam with blue and yellow reef fishes rocking just below the surface. You are enveloped in an ocean wave. There are two comfortable bedrooms and a large living-dining kitchen area with fresh cross ventilation and seaward views from multiple windows. Some times there was a warm, gentle rain and the gentle clatter of bamboo stems; for all six nights the moon was overhead amidst racing clouds. It was quiet and totally private. Bring your books and your Hawaiian music CDs because you will be so comfortable that you will not run out 'go somewhere'. We made breakfast there every day and could not bring ourselves to leave the place until 10:30 or 11:00 in the morning. We made dinner there too, instead of eating out every night. Highly recommended for those who want the true Maui mood of peace amid nature. Gabi your Host is grateful to each and every guest who has shared the Healing & Nurturing Vibrations of this property with us. 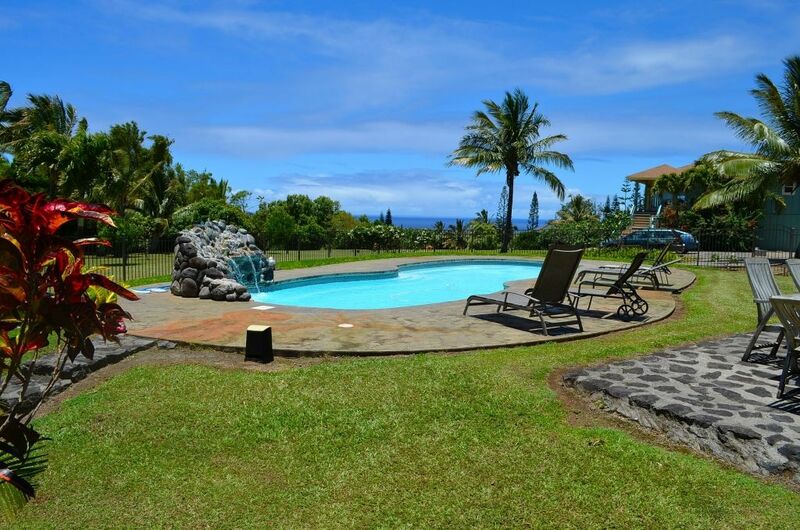 Location,location and location.......and year round heavenly weather...sunrise and sunset walks on Holokai road...swimming in the salt water pool. The Private Hibiscus Hideaway apartment suite a home away from home has stunning ocean views in tropical gardens with a full bath. There a king bed in the bedroom and a full size futon in the living room. It can be rented as a two bedroom also with a choice of a king or two twin beds in the second bedroom. When rented as a one bedroom the second bedroom is left unoccupied. Fabulous ocean and volcano veiws in a tropical garden with a 40 ft. salt water swimming pool, free wi-fi, washer/dryer, bbq etc. 15 miles from the airport off the road to Hana and close to cafes, shopping, beaches and waterfalls. MEDITATION AND YOGA HUT OVERLOOKING THE OCEAN. PROPERTY ABOUNDS IN ORGANIC COCONUTS, PAPAYAS, BANANAS, GUAVAS, LEMONS, LIMES, LILLIKOI ETC. We had never been to Hawaii before. We picked this place because we wanted to be away from the tourist centers. It was lovely. Peaceful, on the north side of the island. It was great for my kids. there is a huge yard with fruit trees they can run around in. For fellow parents, understand that the second bedroom is out the door and across the lanai. It worked out fine for us but other families might not be OK with the situation. Also for those new to the islands there are bugs. Spiders in the house, ghost ants and other creepy crawlies. We didn't know and were a bit weirded out for the first few days. We loved however listening to the gecko's chirping outside at night. We delt with the bugs by putting all open food in the refrigerator. We cooked several times at the house and it was easy and convenient. We had a cane toad that showed up on our lanai most nights. We named him Bob. We did not know that they were poison. So we kept our distance but enjoyed him too. It was also nice to have access to laundry machines. We washed a couple of times after getting clothes super dirty and were grateful for it. The kids also loved the pool and used it most days. It was wonderful to wake up in the morning and see the ocean in the distance and feel the cool breezes. There is no air conditioning, but with the trade winds and the windows open it was fine. The beds were super comfy too. Understand this is not a hotel room. It is part of a house. Our TV did not work in either room at the time. We did not tell the caretaker but are sure if we would have it would have been fixed. We ended up not watching TV at all. All in all it was a wonderful stay. Paia is my favorite place in the world now. I miss it already. I learned so much being there and the house was a big part of it. It is not perfect by any means but it is calm and peaceful. That is why you are going there right? Thank you for your great review Katie. We're grateful for the honest and helpful feedback. We hope that you chose to stay with us again and are aiming to make it better for our guests to enjoy the property and the peaceful air of Maui. To get to Maui Ocean Breezes from the Kahului airport take the Hana Highway toward Paia and Hana. We are just less than 1 mile past mile marker 15. Look for the Holokai Road sign on the right side of the road. Turn left (toward the ocean) on North Holokai Road. We are on the right about 1/2 mile down the road. Look for the mailbox sitting on a stone pillar marked "240". We are 15 miles from the Kahului Airport on the ocean side off the road to Hana. Close to famous wind surfing beaches, waterfalls, the surf town of Paia and the upcountry cowboy town of Makawao with their unique restaurants and boutiques. We are an awesome 35 mile drive from Haleakala volcano summit, 33 miles from Hana, 40 miles from Lahaina and 33 miles from Wailea/Makena.